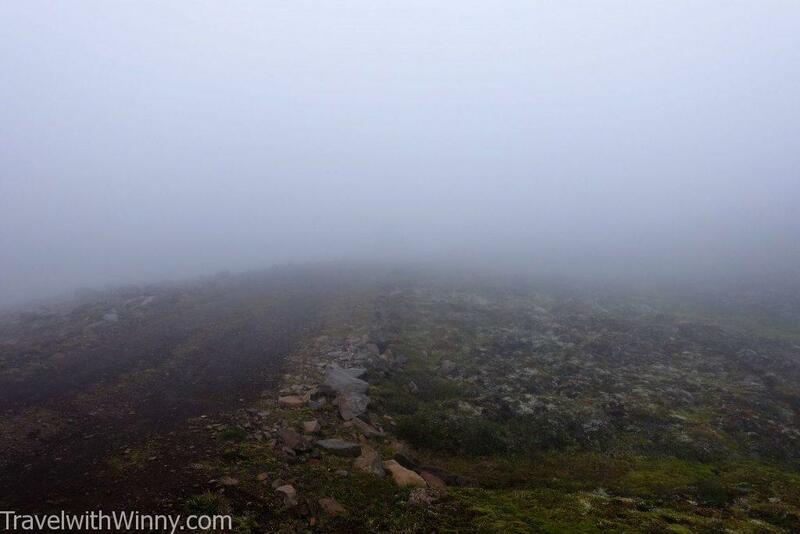 The thick fog in the Icelandic mountain that caused us so much grief that day. We were doing one of the most beautiful hikes of our lifetime! 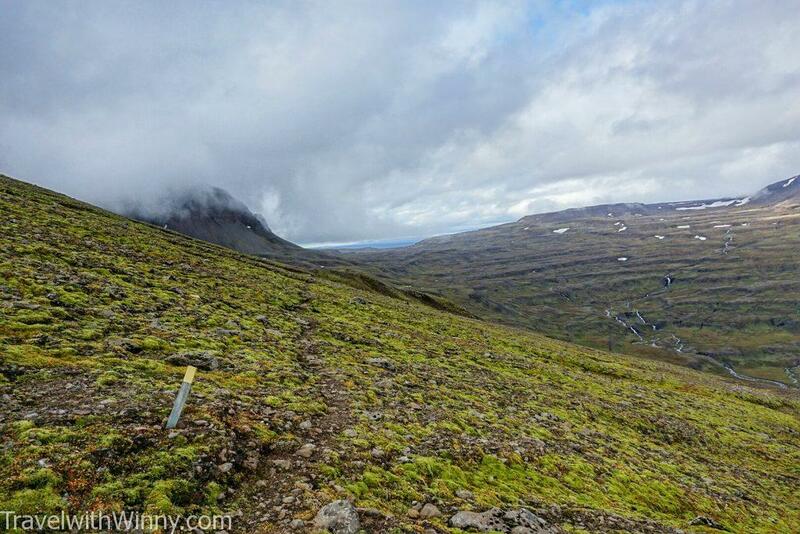 We were around half way through our Iceland trip when we decided to attempt this secluded trail which starts on top of a mountain. 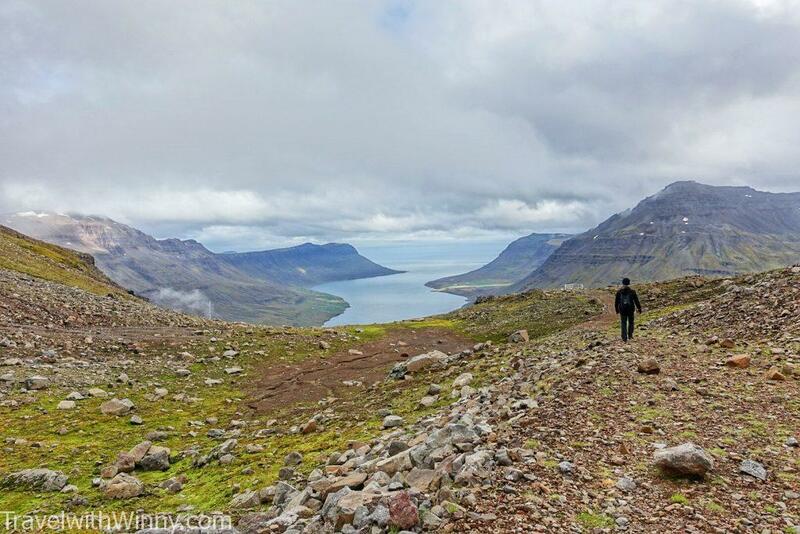 The trail’s name is Bjolfur and it is on a mountain close to a picturesque village called Seyðisfjörður. The road that leads to the trail is very rocky, uneven and steep. Only four-wheel drives can possibly drive up to the start of this trail. We started our walk around 11:30 am in the morning. The scenery of the trail is extremely beautiful as it runs along the edge of a cliff and overlooks one of the most beautiful valleys. We stopped every few meters to take pictures of this every changing landscape. It was our first time walking on a trail has no clear walking trails, only series of yellow wooden sticks to follow every 30 meters. The picturesque trail that only has these yellow tipped wooden markers that mark the path. We have completed only around one-third of this difficult trail after an hour into our hike. At this point, both Andy and I could not make up our minds whether to complete it or not. The hike was more difficult than we first anticipated, we still had a long way to drive before our stop for the night. Winny got cranky and stormed off in to wild. I had to chase her back, so I handed my car key to Andy and told him to wait on the spot for us. I insisted that if we took too long, he should head back to the car first. The village Seyðisfjörður close by. However, to get to the village there is around 10km drive that winds around the mountain. As Winny wasn’t the best at navigating, I found myself chasing after a person that had gone completely off track in the secluded land. I must admit that that being off track the landscape becomes even more extraordinary. There were waterfalls and rivers to cross. After caught up with the Winny- who was extremely lost at that point, I managed to convince her to come back. On our way back to our car, we only saw one couple heading opposite direction to us. No sight of Andy, we thought he must’ve headed back first. The trail was so beautiful and secluded and felt like paradise. However, by the time we got back to the car at 2:10 pm, Andy was not there! Winny and I were both worried and I thought I would head back on the track to look for Andy. On my way back into the Icelandic mountains again, I saw the two hikers which we saw before and they have not seen Andy either. I was beginning to think that he may have slipped and fallen down the cliff. On our way back to the car after our fight. 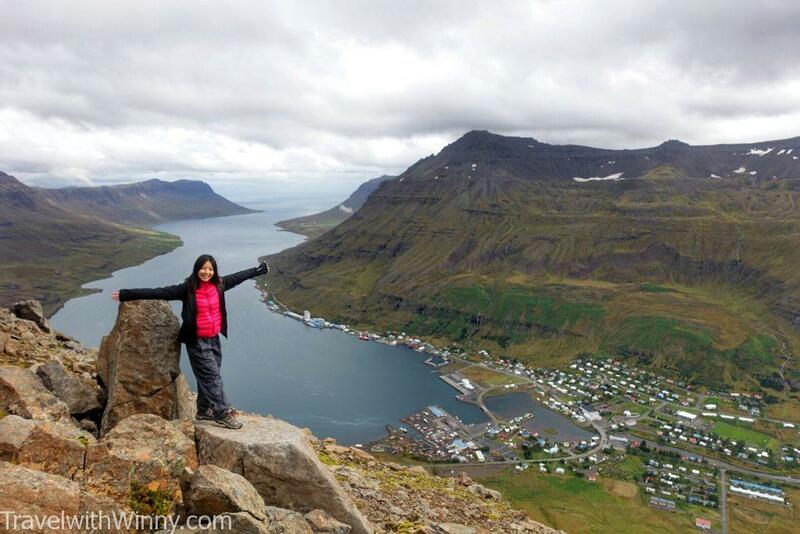 We will soon realize that we have lost our friend in the Icelandic mountains. I hiked the whole way back to the place where I left Andy, yelling his name every couple of minutes. The fog suddenly picked up on my way back to the car and the visibility of the area was getting worse by the minute. The trail became increasingly more difficult to navigate. At the end, I had to use my instincts to work out where the trail was heading. At some point, I thought Andy may already somehow made it back and is in the car waiting with Winny. 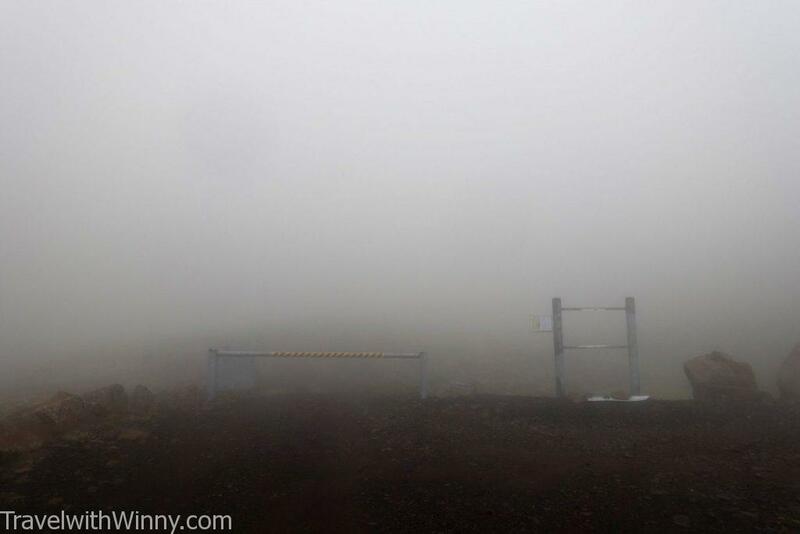 However, at 3:30 pm, Winny was still by herself in the thick fog. It was extremely cold at that point and our hands were freezing. Eventually, we had an emotional breakdown. Sobbed and feared the worst for could’ve happened to our friends. We started to imagine him being injured alone in the mountain. My phone was running out of battery and we couldn’t get Winny and Andy’s phones from the car as it was locked. In a couple of hours, this place will become complete darkness. Even the closest main road is 5km down the mountain! When our phones are out of battery and we were cold and miserable, we could only look down this foggy road and hope that the Icelandic rescue team could find us. Then hopefully find our friend. Eventually, we called the Icelandic emergency number. After explaining our situation the switchboard, we were directed to East Iceland Police Station. 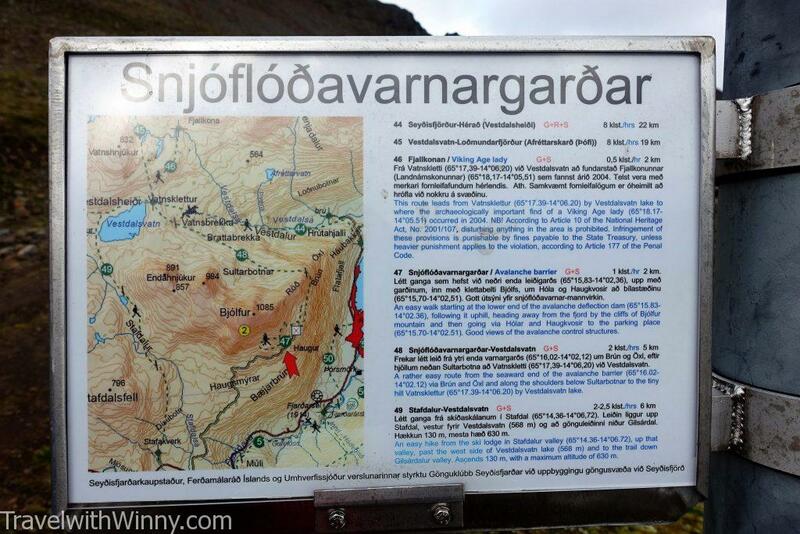 They tried to get our location but we couldn’t even pronounce the name of the Icelandic town- Seyðisfjörður!! The worst was that there were hardly any receptions. The line kept dropping off and we had to call the emergency number again to reach the police. Picture of the fog covered carpark when I came back the second time. In the middle of the conversation, my iPhone suddenly turned itself off due to freezing temperature in the Icelandic mountains. I contemplated about breaking the car window to get access to Winny’s phone which was just sitting inside. Though she kept assuring me that she did tell the police about our location correctly and they would be here in an hour. I decided to take the risk and look for Andy in the fog again while Winny waited for the police. The fog thickened and if I haven’t already walked past the same paths many times, I would have been lost too. Unfortunately by the time I got back the polices haven’t arrived yet. Map showing where we were and the trail that leads to the lake. 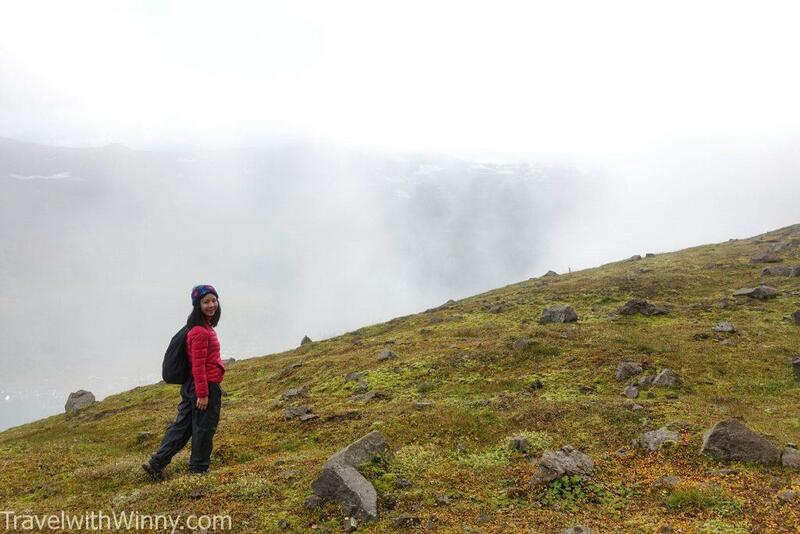 We waited in the Icelandic mountains as darkness approaches and the fog further thickens. We have not seen Andy for almost 4.5 hours now! During this time Winny had left the phone inside her bra and miraculously made the phone warm enough to be turned on again! After contacting the emergency services and then finally the police again, it turns out they were in the area but just couldn’t find us. We told them this location is on Google Map. 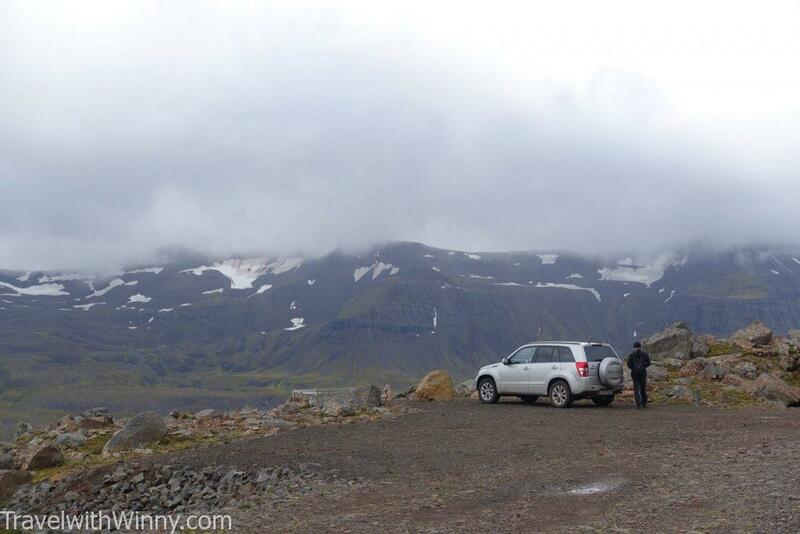 Thank goodness for Google, the Icelandic Emergency Service team were able to find us and we were so pleased to have heard the engine sound coming from the deep fog! 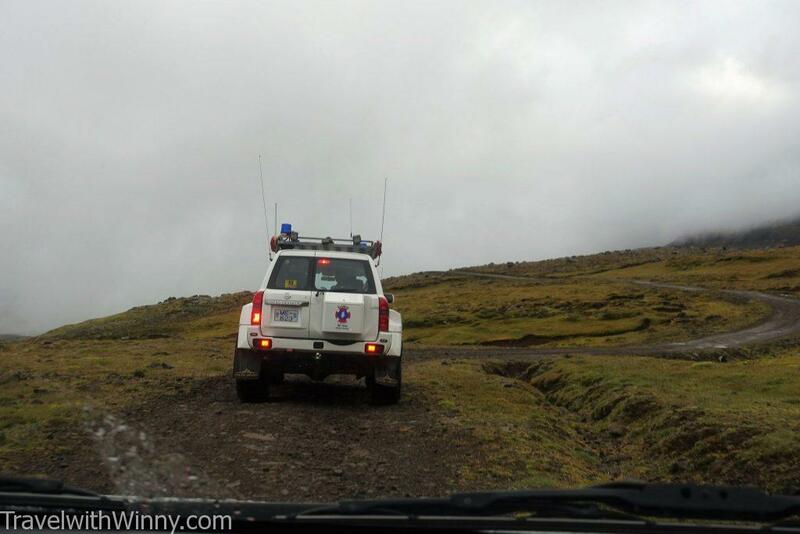 Picture of the Icelandic police rescue car after we followed them down from the foggy mountain. The rescue team that ventured into the Icelandic mountains consisted a team of three people- a police officer and two volunteers. They came in a huge police four-wheel drive with long antennas. The officer first greeted us and we tried to give him as much information as possible. He worked out the area we tracked today from a map and gathered the description of Andy- a young Asian male, wearing a blue jacket and has a huge camera. After a brief discussion with the officer, he decided that the fog was way too dense for the three of them to venture out. He said he will ask the local residences from the town below to help as they know the area better. 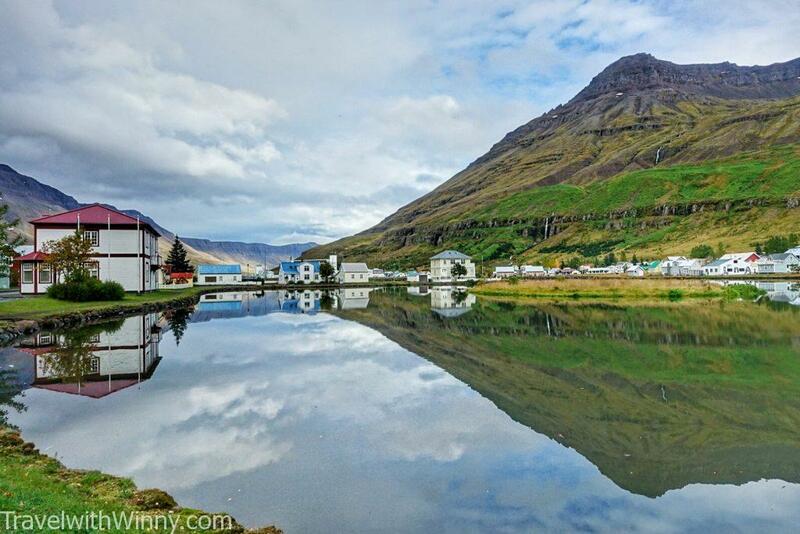 Photo of Seyðisfjörður which we visited earlier that day. Just as the police was about to call the villagers, looked over our shoulders and saw someone walking out of the fog looking exactly what we described. Winny and I were so shocked we didn’t know how to react. We both had tears of joy when we hugged him! It turns out Andy kept on walking after no sighting of us for more than half an hour. Since we deviated on our way back, that’s why we missed each other. 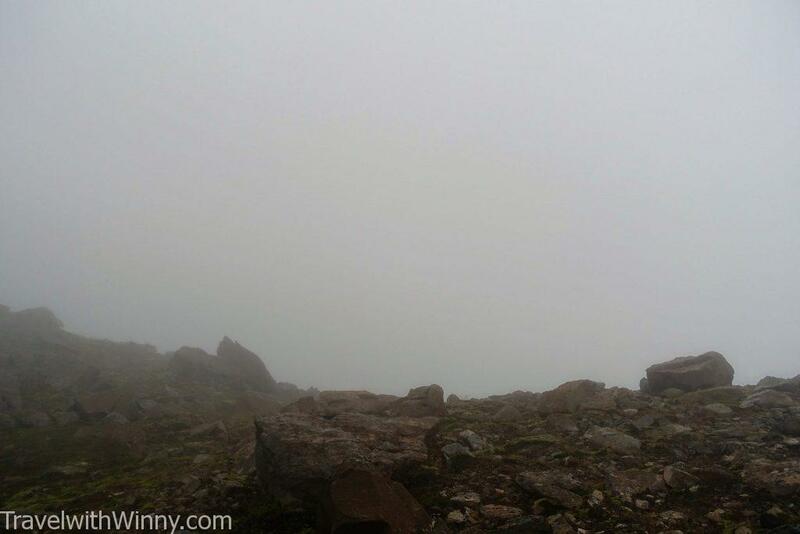 Andy actually walked all the way to the lake but was caught in dense fog which ended up taking him more than 5 hours to complete. We were so overjoyed and shook hands with the police and volunteers thanking them for coming out on a Sunday afternoon despite it ended up to be a false alarm. “As long as your friend is safe.” said the officer. After heading back we realized there was no call out charges for emergency rescue team in Iceland, but the thought of losing a friend in Iceland Mountains was not a risk we were willing to take. This became one of the scariest moments we had during our round the world trip!